The year is 1854 and a cholera epidemic ravages the land, leading to demands for a clean water supply and proper sewage systems, especially in poor neighbourhoods like Carribee Island. But can you believe there was opposition here in Wolverhampton, to this grand vision to combat squalor and disease? I discovered an article many years ago, said to be from the pen of a self-styled “Sanitary Reformer” and member of the fantastically-named “Association for the Reduction of Overweening Vanity”. It was initially in the form of a pamphlet published by John Beddow, bookseller, and newsagent, Worcester Street, Wolverhampton. The image above shows page 6 of the 1847 Wolverhampton Post Office Directory. 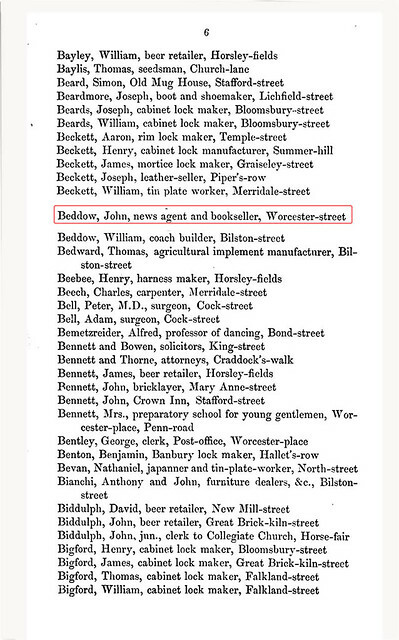 Hidden amongst the “professor of dancing” and the patron of the “Old Mug House”, we find John Beddow of Worcester Street as a “newsagent and bookseller”. It is within this man’s printing we find the work of our satirical saviour. 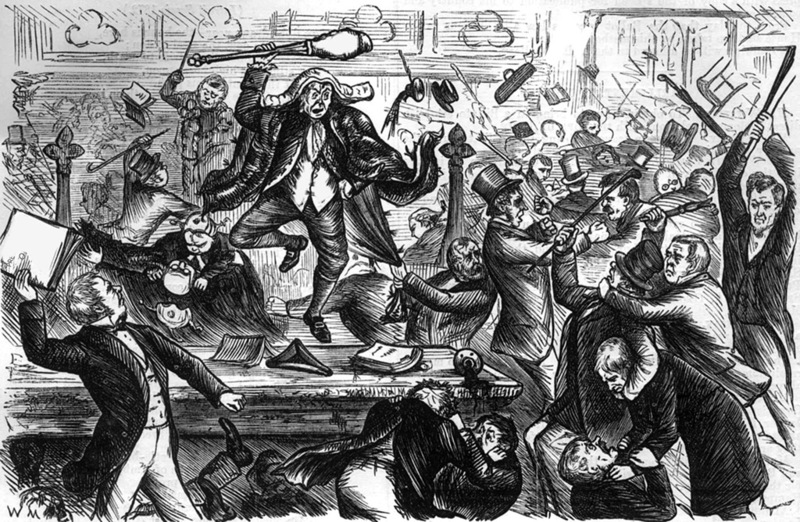 The pamphlet was written when the question of sewerage in the borough was under discussion by the Town Council, and the selfish meanness of a number of small property owners was only too apparent in their systematic and unwise opposition. A slight exaggeration of the difference of opinion at the final Council Meeting regarding voting on the new sanitation project. It was written by a man who referred to himself as a “Local Proteus. Fellowsiana”, the name for a Greek sea god capable of assuming different forms, but whom whose identity was not revealed until some time later. The title of the pamphlet shows the same inventive genius as the content, and, with its reproduction here, I am sure you will agree it contains much that would be interesting even now. And lessen your poor rates, call him a knave, Who thus would mulct* Caribee Island! On seeing and smelling and breathing may float Far away from sweet Caribee Island! A piece in the local press went on to say it was one of the cleverest pamphlets of its class. In spite of the sharpness of its satire, and the personality of its subject, it keeps carefully within the bounds of legitimate criticism, while its motive was undoubtedly inspired by a policy which had the public good as its aim. When you consider the text’s mention of “Corser and Banks” was directed at two town councillors, the identity of publisher becomes even more interesting. Was Bilston born (in 1814) and, in the earlier part of his life was famous – or perhaps notorious – as a businessman in the iron trade and a councillor in Wolverhampton. Fellow councilor, Samuel Griffiths was the man behind the wit. 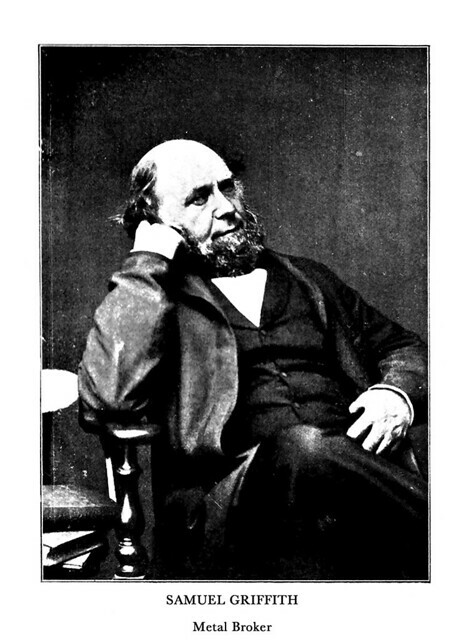 He is best-remembered today as the author of “Griffiths’ Guide to the Iron Trade of Great Britain”, which was first published in 1873, but which was of sufficient lasting interest to merit a reprint by David and Charles in 1967. Griffiths was clearly a clever man, full of energy and drive, and was a prolific speaker and writer. By 1850 he was doing well enough to build Whitmore Reans Hall on the site of the principal buildings belonging to Whitmore End House and Farm. The building had huge walls, which ran along Lowe Street with a drive up to the house via a gated entrance in Evans Street. 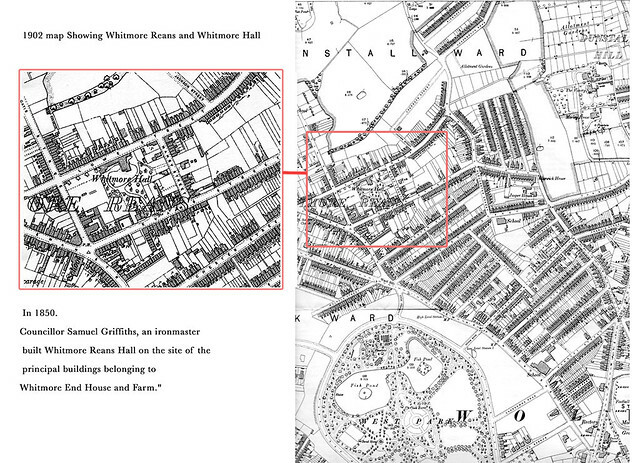 Later the hall was owned by the Evangelist Brothers and then became St. Winifred’s Girls’ Home. two high-rise flats now stand roughly where Whitmore End House stood almost 160 years ago. In the latter part of his life, Griffith’s fame rested on this book and the fact that he was the proprietor and editor of the London Iron Trade Exchange. But his enthusiasm sometimes ran away with him, and his business sense seems not always to have been the best. Griffiths was no stranger to political controversy or bankruptcy, but he always bounced back. He seems to have been regarded as a rogue, but a likeable one and his good-heartedness was recognised. He eventually left for London sometime around 1866. Perhaps his infamy in Wolverhampton had become too much for him, or perhaps London attracted him. By this time, his main business was as a publisher to the iron trade and in this, he seems to have established a good business and a sound reputation. He died in London in 1881, at the age of 67. Join me again next time for another tale; a poignant story found inside the family bible.